By Mario Ajero. Discovered by Player FM and our community — copyright is owned by the publisher, not Player FM, and audio streamed directly from their servers. Nocturne in C-sharp Minor, Op. posth. 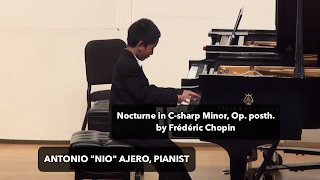 by Frédéric Chopin performed by 10-year-old pianist, Antonio "Nio" Ajero. Recorded live at Cole Concert Hall at Stephen F. Austin State University on October 24, 2014. 32 episodes available. A new episode about every 70 days . 14-year-old pianist Antonio "Nio" Ajero performs Transcendental Etude No. 10 in F Minor by Franz Liszt. Recorded at the Cremona International Music Academy's Winners Concert in the performance hall of the Museo del Violino in Cremona, Italy.By mario.ajero@gmail.com (Mario Ajero). Video lesson on how to play the piano part of "Havana" by Camila Cabello featuring Young Thug. To download the sheet music, visit: https://www.sheetmusicplus.com/title/havana-digital-sheet-music/20504743?aff_id=198335By mario.ajero@gmail.com (Mario Ajero). "Clair de lune" by Claude Debussy arranged for piano six-hands by Greg Anderson. Pianists - Mario Ajero, Antonio "Nio" Ajero, & Olivia Ajero Recorded live at Cole Concert Hall at Stephen F. Austin State University in Nacogdoches, Texas.By mario.ajero@gmail.com (Mario Ajero). Learn about Scott Joplin's piano piece, "Great Crush Collision March" which was named after and inspired by a publicity stunt on September 15, 1896 near Waco, Texas. This online lecture/performance is part of the centennial honoring 100 years since Scott Joplin's death in 1917.By mario.ajero@gmail.com (Mario Ajero). Star Wars: The Force Theme by John Williams performed by Mario Ajero, pianist.By mario.ajero@gmail.com (Mario Ajero). Romance for Six Hands at One Piano by Sergei Rachmaninoff performed by Mario Ajero, Antonio Ajero, and Olivia Ajero in Cole Concert Hall at the Stephen F. Austin State University School of Music in Nacogdoches, Texas.By mario.ajero@gmail.com (Mario Ajero). Improvised piano variations on a theme by Paganini (Caprice No. 24) by 10-year-old pianist Antonio "Nio" Ajero. Please vote for his video at http://www.socialmusicworks.com or http://ow.ly/Mozj3 before May 21, 2015.By mario.ajero@gmail.com (Mario Ajero). Best Day of My Life by American Authors cover played Nio using the Piano Maestro iPad app from JoyTunes. Guest appearance by little sister Olivia.By mario.ajero@gmail.com (Mario Ajero). 6-year-old pianist Olivia Ajero plays an arrangement of "Auld Lang Syne" by Phillip Keveren from "More Christmas Piano Solos Level 5" published by Hal Leonard. She plays with MIDI accompaniment powered by Home Concert Xtreme by Timewarp Technologies. Happy New Year from the Ajero Family!By mario.ajero@gmail.com (Mario Ajero). Impromptu in A-flat Major, Op. 29 by Frédéric Chopin performed by 10-year-old pianist, Antonio "Nio" Ajero. Recorded live at Cole Concert Hall at Stephen F. Austin State University on October 24, 2014. View the entire recital at: http://youtu.be/Oj3AoTNOE64By mario.ajero@gmail.com (Mario Ajero). Nocturne in C-sharp Minor, Op. posth. by Frédéric Chopin performed by 10-year-old pianist, Antonio "Nio" Ajero. Recorded live at Cole Concert Hall at Stephen F. Austin State University on October 24, 2014. View the entire recital at: http://youtu.be/Oj3AoTNOE64By mario.ajero@gmail.com (Mario Ajero). Arabesque No. 1 by Claude Debussy performed by 10-year-old pianist, Antonio "Nio" Ajero. Recorded live at Cole Concert Hall at Stephen F. Austin State University on October 24, 2014. View the entire recital at: http://youtu.be/Oj3AoTNOE64By mario.ajero@gmail.com (Mario Ajero). 10-year-old pianist, Antonio "Nio" Ajero performs Romance sans paroles (Song without Words), Op. 17, No. 3 by Gabriel Fauré. Recorded live from his piano recital on Oct. 24, 2014 in Cole Concert Hall at Stephen F. Austin State University.By mario.ajero@gmail.com (Mario Ajero). Prelude and Fugue in C Minor BWV 847 from The Well-Tempered Clavier Book 1 by J.S. Bach performed by 10-year-old pianist, Antonio "Nio" Ajero. Recorded live at Cole Concert Hall at Stephen F. Austin State University on October 24, 2014. View the entire recital at: http://youtu.be/Oj3AoTNOE64By mario.ajero@gmail.com (Mario Ajero). With help from the Yamaha Disklavier Piano, 5-year-old Olivia Ajero plays "Snowcrystals" by Jennifer Linn from the Hal Leonard Student Piano Library Piano Solos Book 5.By mario.ajero@gmail.com (Mario Ajero). My 5-year old daughter fractured a bone in her arm. In this video, we show how we work around the injury to continue practicing piano including using MIDI accompaniments played through the iPad.By mario.ajero@gmail.com (Mario Ajero). Antonio "Nio" Ajero performs the Impromptu in A-flat Major, Op. 29 by Frédéric Chopin at the 2014 SMU Institute for Young Pianists in Dallas, TX. Nio won 1st prize in their piano competition for students in grades 4-6.By mario.ajero@gmail.com (Mario Ajero). Innocence Op. 100, No. 5 by Johann Friedrich Burgmüller 2014: Olivia Ajero, pianist (age 5) 2010: Nio Ajero, pianist (age 6) with Olivia Ajero (age 2) MIDI accompaniment played on Home Concert Xtreme for iPadBy mario.ajero@gmail.com (Mario Ajero). How to import sheet music into your iPad using the built-in camera, the JotNot Pro scanner app, and ForScore music reader app.By mario.ajero@gmail.com (Mario Ajero). Start listening to The Piano Podcast HD with Mario Ajero on your phone right now with Player FM's free mobile app, the best podcasting experience on both iPhone and Android. Your subcriptions will sync with your account on this website too. Podcast smart and easy with the app that refuses to compromise.